St. Alphonsus is proud to be the Charter Organization to Boy Scouts of America Pack 125 and Troop 322. Scouting helps boys to become more conscientious, responsible and productive members of society. The Boy Scouts of America is one of the nation’s largest and most prominent values-based youth development organizations, providing programs for young boys that build character, trains them in responsibilities of participating citizenship and develops personal fitness. For more than 100 years, BSA has helped build future leaders by combining educational activities and lifelong values with fun. Pack 125 (Cub Scouts): For boys Grades 1-5, Cub Scouting is the foundation of our organization and involves the whole family as parents pitch in to plan and deliver activities. Troop 322 (Boy Scouts): For boys 11-17 years old, this is the traditional Scouting experience for young men. While there's guidance from experienced leaders, Boy Scouts take their own lead, exploring places they've never been as they dive into the rugged world of outdoor adventure. 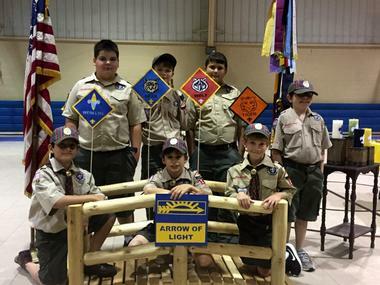 The Troop meets Monday evenings from 6:30 PM to 8:00 PM in the Multi-purpose building. The Pack meets the second Wednesday of the month in the St. Francis room at 6:30 PM. If interested contact Cindi Schlatre, the Scout Liaison, at 225-261-4644.